I confess to being just a little steamed. I just read where some hair-brained school administrator in Michigan stricken with the horrifying disease of liberal wussification did not allow some little boy to put toy soldiers on the cup cakes he brought to school. Why may you ask? Well, toy soldiers have guns and guns are bad. Therefore, toy soldiers must be some kind of bad influence. Oh, oh, toy soldiers with guns! This is what happens when liberals start to run the world. I guess I must be messed up because back in the day (1960’s) my little friends and I played with toy soldiers and toy guns. We must be screwed up given the amount of time we devoted to the “little wars” we fought with our army men and the time we spent playing “army” with our toy guns (and sticks we pretended were guns). To us, it was quite normal to play army. You were a boy, that’s what you did. Yeah, back in the day little boys played with little boy toys like army men and toy guns and little girls played with dolls and tea sets but that all started to change when the liberal wussified establishment declared war on “war toys” and American History in the 70’s. Toy soldiers fell out of favor as did toy guns and little boys started to grow up getting in touch with their feminine side, meaning the liberal wussified of whatever that was supposed to mean. And now it’s to the point we can’t have toy soldiers in public schools. Just another reason to be for school choice. My parents dug over their garden a couple of years ago and loads of toy soldiers me and my brothers had lost over the years turned up…I was so excited to see them. They have pride of place on my book shelf. 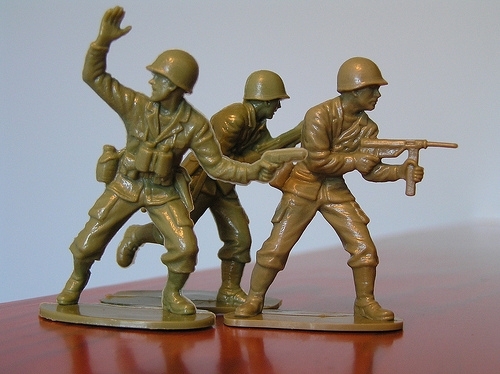 Nothing wrong with playing with toy soldiers! Haha, yeah, I had hundreds of them. Bought them for my son too who just passed them on to my grandson! I “graduated” into the 20mm Airfix figures in the late sixties for wargames armies. I had thousands of those until the lead figs came out. Thanks Nick. All so true Rob The only thing I wanted for Birthday or Christmas was the best firepower available in the catalog . I Still have not guned anyone down. Bruce, you are correct in noting the differences in generations. Heck, when Old Bill was in school there were guys who hunted squirrels, ducks, etc all over Texas before and after school…. and their guns came to school with them. Oh yeah, nobody was shooting up schools until after about 1960 something… I wonder what changed?…. It certainly wasn’t the increased availability of firearms.